It’s just after breakfast and an elderly New Orleans jazz singer, wearing the prerequisite trilby and dark glasses, is serenading passers-by. Around the corner, a group of young hipsters with a skiffle board, banjo and double bass strike up toe-tapping numbers and quickly attract an audience. Whatever the time of day – or night – you can’t help but get into the rhythm of life in New Orleans. Nicknamed ‘The Big Easy’ for its laid-back attitude, and famous for its February Mardi Gras celebrations, Louisiana’s largest city is quite unlike anywhere else in America. Shaped by a melting pot of European and Caribbean cultures, its diverse districts include Tremé, a vibrant African- American neighbourhood, the tree-lined Garden District, with grand pillar-fronted colonial mansions, and the Arts (or Warehouse) area, where old industrial buildings with faded advertisements painted on the brickwork have been transformed into museums, galleries and restaurants. The French Quarter is the main tourist hub – wall-to-wall boutiques, antiques shops, restaurants, bars and live-music venues rub shoulders with voodoo stores. We strolled down to Café Du Monde off Jackson Square for coffee and beignets – square fluffy doughnuts smothered in sugar – before continuing along the attractive waterfront that hugs the bank of the mighty Mississippi. From here, paddle-wheel cruises provide leisurely excursions, but we opted for another form of authentic transport aboard one of the city’s trams, or streetcars. Dating back to 1835, the St Charles route is the world’s oldest continuously operating streetcar line, and is a slice of history in its own right. Even if you’re not going anywhere, it’s worth taking a slow, rattling ride for the fun of it as single fares are only $1.50 and a day pass is $3. The tram is also a convenient way to reach the city’s landmark cemeteries, which are a surprising attraction. Because the city is built on a swamp, the dead are buried above ground in elaborate crypts. The most visited tomb in Saint Louis Cemetery is that of legendary voodoo practitioner Marie Laveau, immortalised in Redbone’s 1971 hit The Witch Queen Of New Orleans. Downtown is flat and walkable with signposts directing you to the major sights. The only curiosity is the lack of pedestrian lights, but there is a reciprocal crossing code between drivers and walkers. Start the day with an ‘eye opener’ cocktail and three-course breakfast at Brennan’s, a unique institution that reopened last autumn following a multimillion dollar makeover. 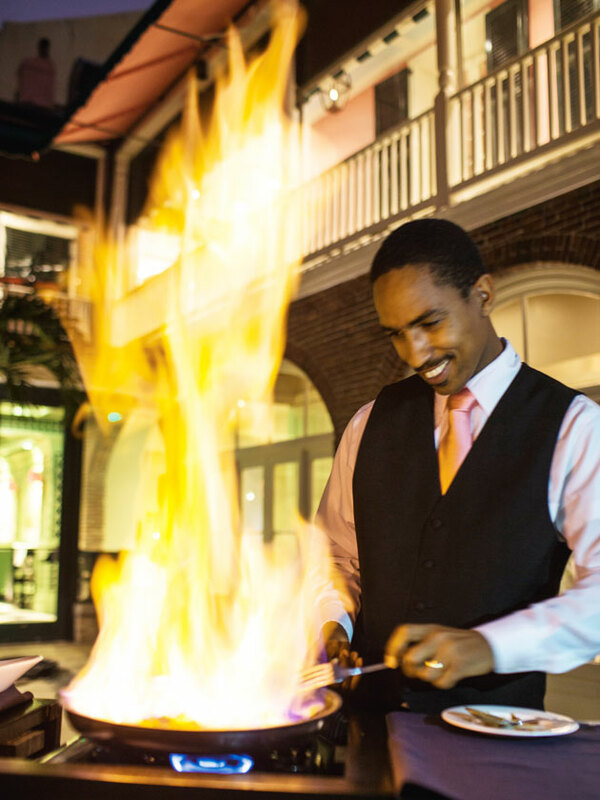 Try the spectacular signature dish, Bananas Foster, flambéed in rum by your table. We stayed in the International House Hotel, which occupies a great spot near to the French Quarter. A beautiful, classic Beaux Arts facade opens on to a soaring lobby furnished with old, new and idiosyncratic objects that unite the city’s multicultural influences. Our stylish room was decorated in muted contemporary tones, with a vast shower that was very welcome after a day’s sightseeing. Suitably refreshed, we couldn’t resist a drink in the opulent bar where the exotic cocktail menu is clipped to old bingo boards. 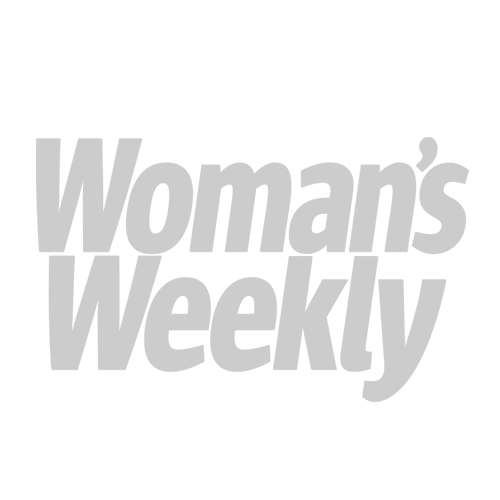 The hotel – which will soon open a restaurant – has coffee, tea and breakfast snacks in the reception area. But in New Orleans it’s customary to eat out for breakfast, lunch and dinner, which, of course, maximises your chances of trying all the amazing food on offer. A po-boy (traditional Louisiana sandwich) is great for lunch and it’s worth joining the queue in Johnny’s to try one. One evening we ate a meal at SoBou that started with yellowfin tuna cones and avocado ice cream and ended much later with a trio of mouth- watering chocolate desserts. Next day, a short taxi ride took us to bustling Cochon for a taste of authentic Cajun cooking. Don’t miss the wood-fired oysters with chilli garlic butter. Have a rest in the peaceful Sydney and Walda Besthoff Sculpture Garden – take the green Canal streetcar line. 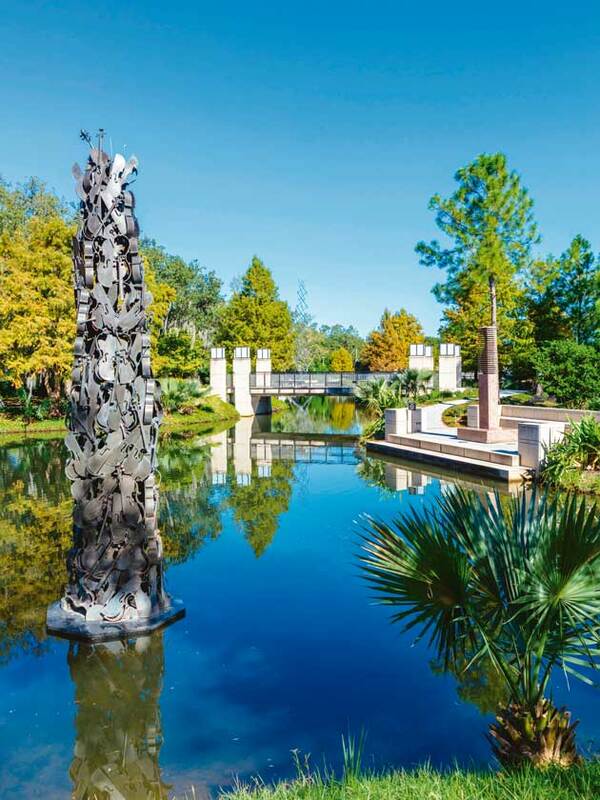 Striking artwork is spectacularly set amidst a five-acre outdoor oasis next to New Orleans Museum of Art. 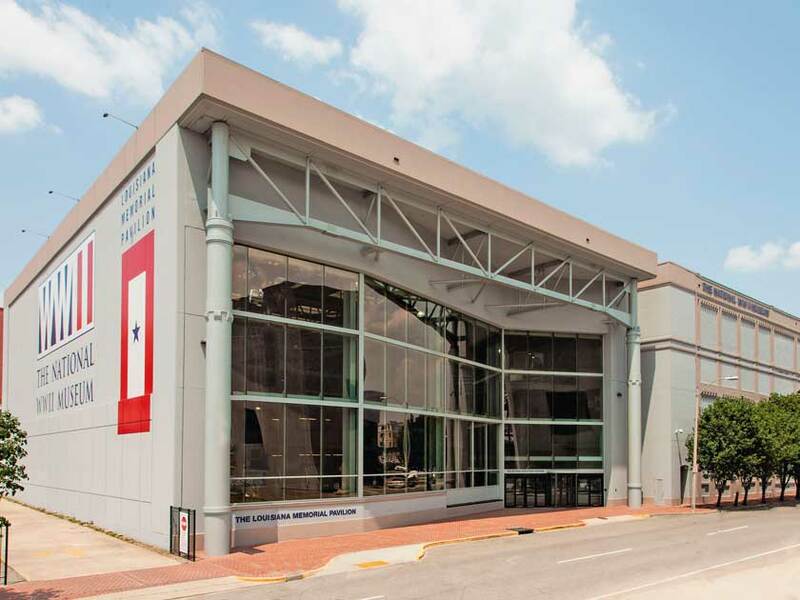 Housed in three buildings, the impressive National WWII Museum features engaging exhibits and the 4D Beyond All Boundaries experience, narrated by Tom Hanks. 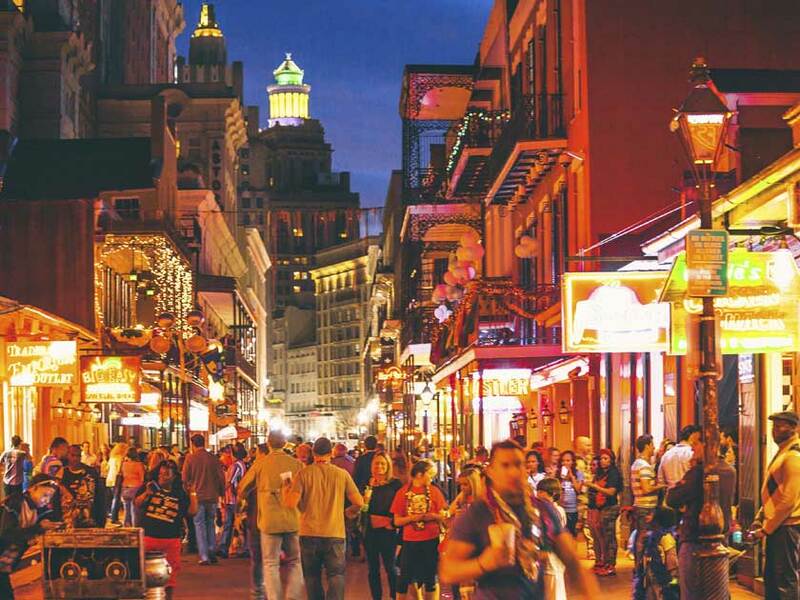 If you have the stamina, then the party city of New Orleans can provide the nightlife. The perennially busy Bourbon Street has long been a magnet for night owls, but I preferred the atmosphere in the less frenetic Frenchmen Street, near the river. The $5 entry at the packed Spotted Cat Music Club paid for a rolling programme of live acts. Afterwards, we stopped for a nightcap on the way back to the hotel in the stylish, retro surroundings of Bourbon Street’s renowned Irvin Mayfield’s Jazz Playhouse. Meandering past closed shops, where some windows were occupied by snoozing cats and dogs, we vowed to return the next day for a spot of shopping. Voodoo aside, New Orleans is a magical city and there’s so much more to it than Mardi Gras.